Updated Sunday November 22, 2015 by Kitchener Sports Association. 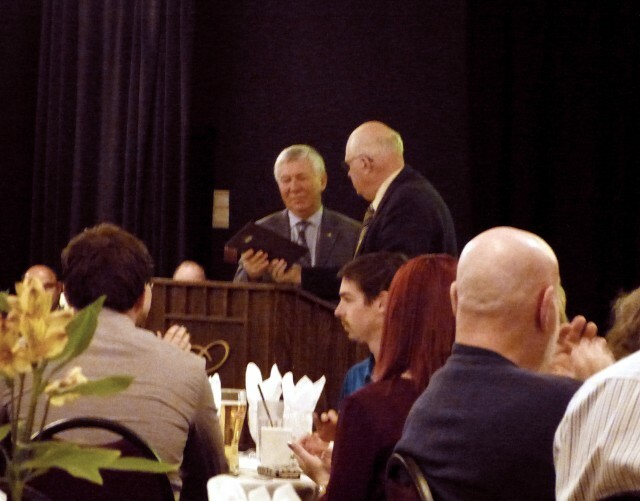 PHOTO: Kitchener Mayor Carl Zehr received a special KSA Volunteer Award for all he did for the local minor sports community while mayor. KSA's Bob McKillop is shown making the presentation. at the KSA Volunteer Recognition Dinner. At the Edelweiss Sports Bar & Grill. In addition to serving on all regular standing committees of Kitchener city council, Carl is also an appointee and active participant on many boards and committees, including the Mayor's Advisory Council for Kitchener Seniors (MACKS), Kitchener-Wilmot Hydro Inc. Board of Directors, University of Waterloo Board of Governors, Kitchener Housing Inc. Board of Directors, Centre in the Square Board of Management and Downtown Kitchener BIA Board of Directors. Kitchener Mayor Carl Zehr (KSA award for his years of leadership championing local minor sports, tournaments and facilities). Each of this year's 26 award recipients was introduced by a member of his/her sports organization and received a commemorative plaque from KSA. On behalf of all those in the community, especially the athletes, we congratulate these volunteer leaders and thank them, and the countless others, for all they do to ensure we have great sports programs. Fee-assistance grants: Kitchener Minor Baseball, KW Minor Boys Softball and Stanley Park Optimist Ball. KSA Hockey Helps the Homeless Legacy grants: $6,180 to the House of Friendship for its "Kids Outdoors Program" (For sports equipment), and $4,500 to Lutherwood to help establish the Bike Program at the Safe Haven Shelter. It was a very busy, very enjoyable, and very memorable evening!